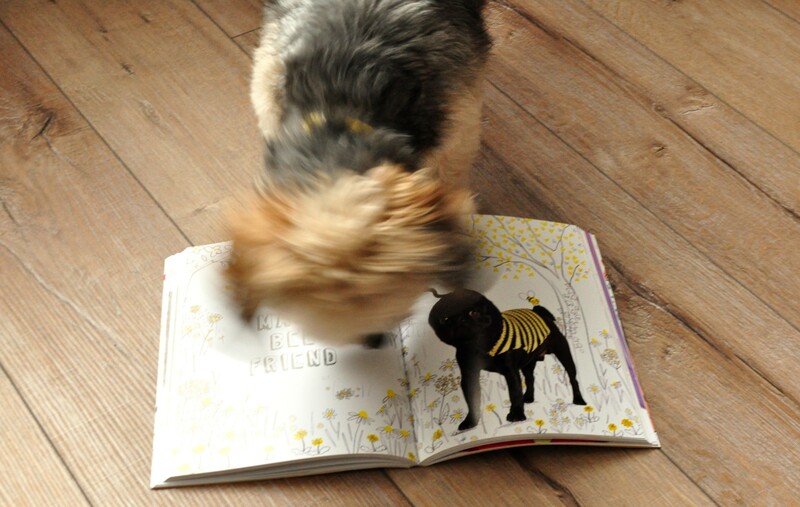 Last week I ran a giveaway for a copy of Woolly Woofers by Debbie Bliss. Thank you so much to everyone who entered. The winner is nswifty, congratulations Niamh, I’ll be contacting you as soon as this post publishes and will get the book to you early next week. I plan on running more giveaways, most likely my favourite patterns, using Ravelry’s ‘send as a gift’ facility. 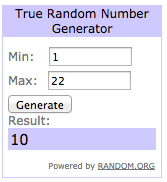 Using this option I can gift a pattern to anyone with either a Ravelry account or email address. Giveaways are so much fun. So I also mentioned an update. We’ll I finished two WIPs from my list; the baby cardigan which is going to it’s new owner today and the shawl has finally been bound off and blocked. I’ll have photos to share next week. And I’ll be starting the second slipper for my sister in law this weekend. The one thing I will say in my defence, it’s hard to photograph things in the winter. I’m never home during daylight during the week and at weekends it’s pure lucky if you get a bright day. But come rain or shine I’m taking my camera out this weekend – I am going to force the creativity back into myself if I have to. You may have noticed that things have been a little quiet around here lately. One of the reasons for this is because my knitting mojo seems to have taken a sabbatical. In fact my creativity full stop has gone on holidays so I haven’t even felt much like writing. But I am determined to break through the barrier and get back to my knitting and my blogging. Because even though I don’t really feel like doing either I still miss them. So what have I been up to? Well the last project I actually finished were a pair of Cadeautje by Ysolda Teague for the Knitmas swap I took part in before Christmas. I finished those at the end of November and I didn’t even have time for a proper photoshoot before posting them. Since then I’ve started several projects but have yet to come even close to finishing any of them. Cladonia by Kirsten Kapur. I’m about a third of the way through the picot bind off on this one, and it’s been sitting waiting to be finished since about mid-November I’d say. 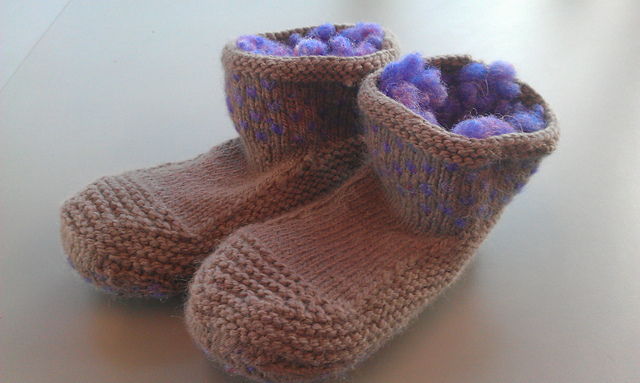 A second pair of Cadeautje by Ysolda Teague for my sister-in-law. I finished one slipper in time for Christmas but the second has yet to materialise. Sorry A! I had also planned on knitting a pair for my husband and a pair for me. I’m not holding my breath. Mug Sweater by nawano. I had a great idea to knit mug sweaters for each of my colleagues for Christmas, I think 15 in total. I even knit, blocked and seamed about half of the bodies and bought the little clasps for the hands, but that’s as far as I got. Maybe for Easter? Bronntanas by Ysolda Teague. This was for a special friend who agreed to do some graphics for my blog. I’m a couple of rows past the brim. I’m using my favourite Coolree yarn and it’s a really straight forward pattern so I don’t know what’s holding me back. Sorry Y! Super Easy Baby Blanket by Purl Soho. God! I haven’t even started this one, but did choose the pattern as well as some yarn I picked up at HandmAid. I know at least 3 people who are pregnant at the moment so this was planned to be for one of these new humans. Chevron Baby Blanket by Espace Tricot. I bought the yarn for this blanket in the sale in This Is Knit just after Christmas, again planned for one of three new humans. I even mananged a few stripes before realising I had cast on too few stitiches it was too narrow. I need to rip this out and start again. 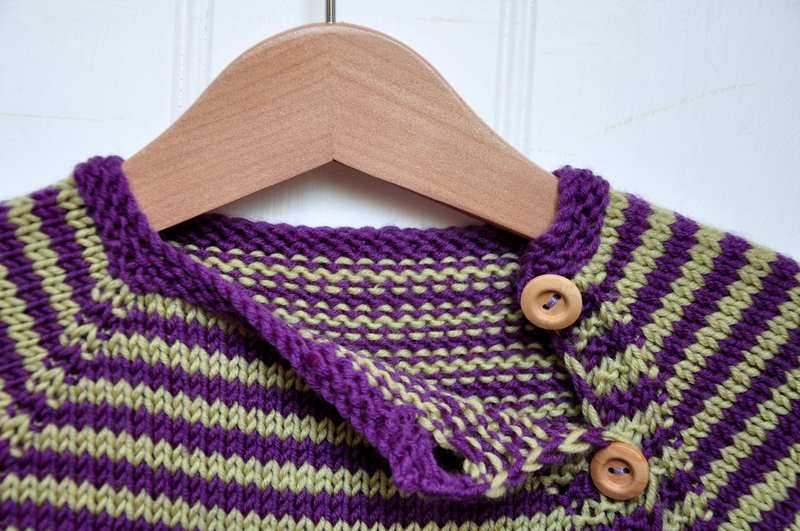 in threes: a baby cardigan by Kelly Herdrich. I’m actually making some headway with this one, mainly because this fourth new human has actually arrived. Having said that though progress is still slow. I am a monogamous knitter so this does number of WIPs does not sit well with me. At all. But I have a plan. My plan is to finished the In Threes cardigan for the newly arrived new human. Then I’m going to finish my Cladonia (that I cast on in October!). Then I am going to knit my SIL’s second slipper. Then I’m going to reassess if my knitting mojo has fully returned and see where I go from there. As I mentioned there are three new humans on the way over the next year, and each of them belongs to a close friend or family member so I suspect there will be much knitwear needed. And that’s ok, because until my knitting mojo returns with gusto small, easy projects are probably all I will manage. I have a feeling 2015 is going to be a year of baby knitting for me and that’s ok. This week I’ve been trying out a new baby pattern, Beyond Puerperium by Kelly Brooker. I’ve knitted several In Threes by Kelly Herdrich for various babies. But I waiting until this baby was born, and being a boy, I decided that In Threes was perhaps too ‘girly’. I hate this concept of ‘boyish’ and ‘girly’, I know that men and women are different, but the differences are not binary, not blue and pink, the differences are on a spectrum. Anyway, for this little boy I decided on Beyond Puerperium. What I love about this pattern is that instructions are given for a number of yarn weights in a number of sizes. I found some superwash DK in my stash in purple and green. It knit up really quickly and is super cute. I don’t know very much about babies, but I’ve been told that the buttons down the side make it easier to dress the baby, rather than having to pull a jumper down over their heads. There are a few things I’ll do differently next time (and there will be a next time). The first is the buttons. 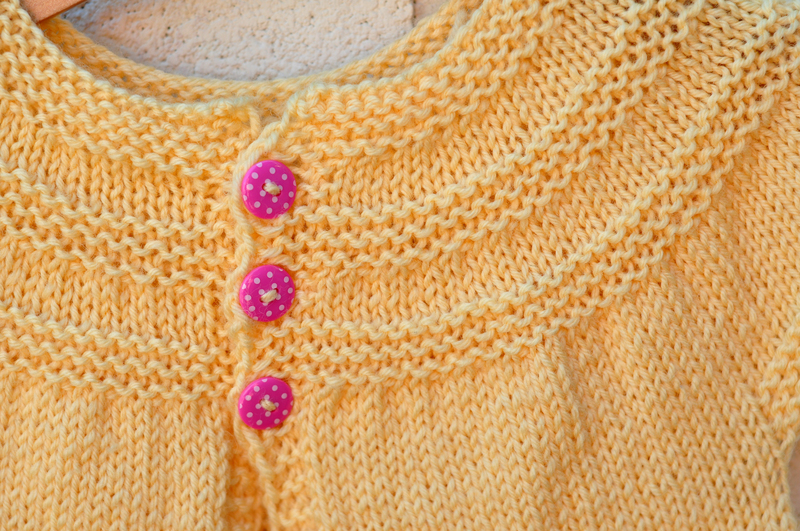 I don’t know if I placed them too far apart, but the buttons along the yoke are pulling a bit. If anyone has any suggestions on how to fix this I would love to know in the comments. Do I need to place the buttonholes closer together? Or do I need sew the buttons farther from the edge of the fabric? 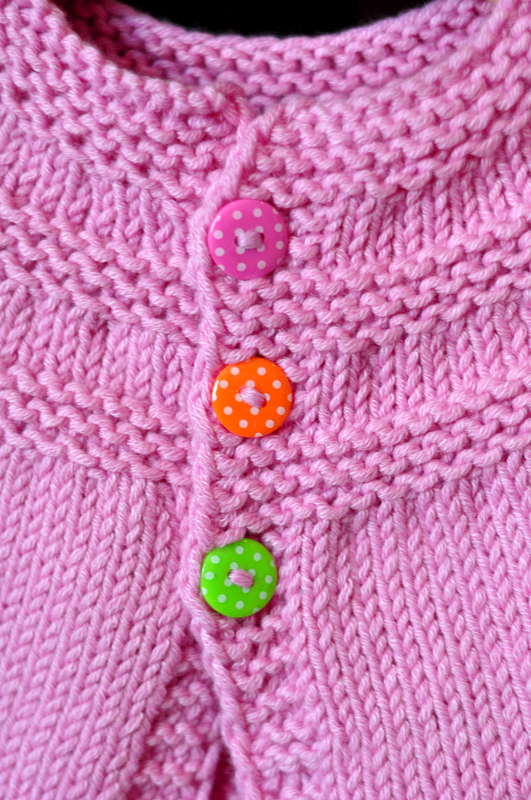 The second thing that I would do differently is that I would knit the button band in the same colour as the cuffs, rather than having a striped button band. By slipping the stitches you get a really neat edge, but the colours kind of bleed a bit on the stripes. This isn’t a big deal, but I think it would be neater if it was a solid colour. 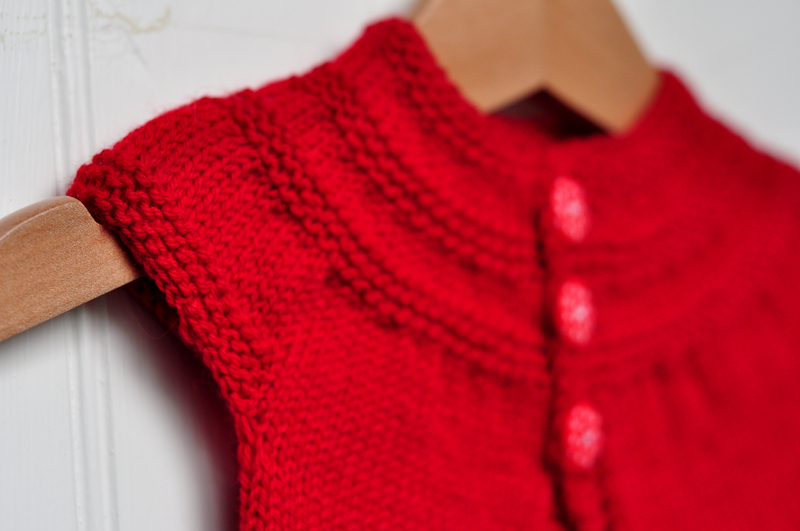 This is going to be a quick post to share some pictures of a cute cardigan I knitted recently. 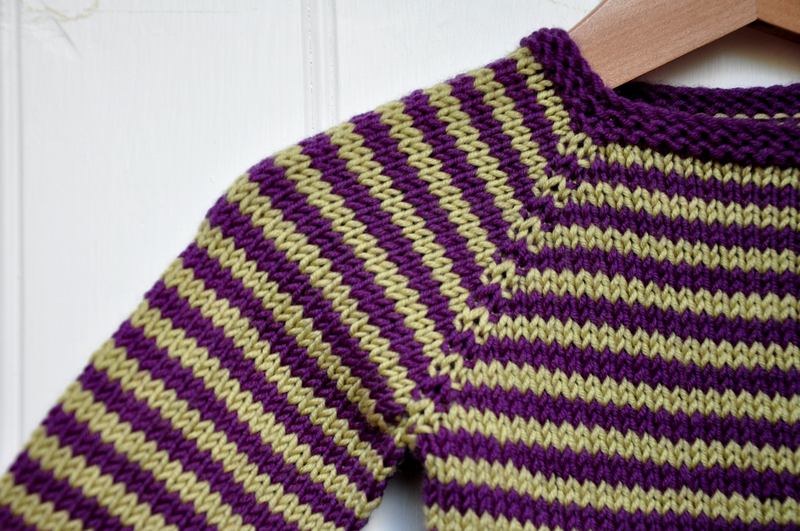 I used my favourite pattern – In Threes by Kelly Herdrich. Three reasons I love it? No sleeves so no wrestling with DPNs or magic loop, no seams and no button band to pick up and knit. You just knit it and then you’re done (except for the buttons and weaving in ends). 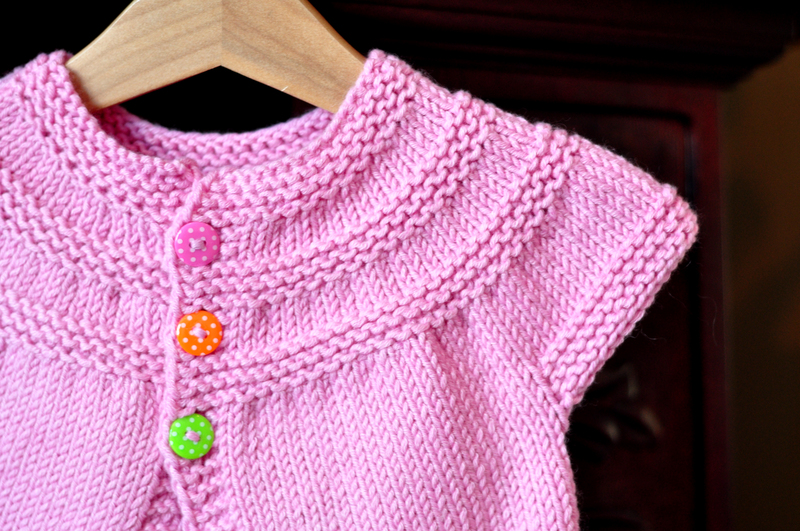 I wanted to make a preemie size cardigan for a special little lady. The pattern recommends aran weight yarn on 5mm needles. 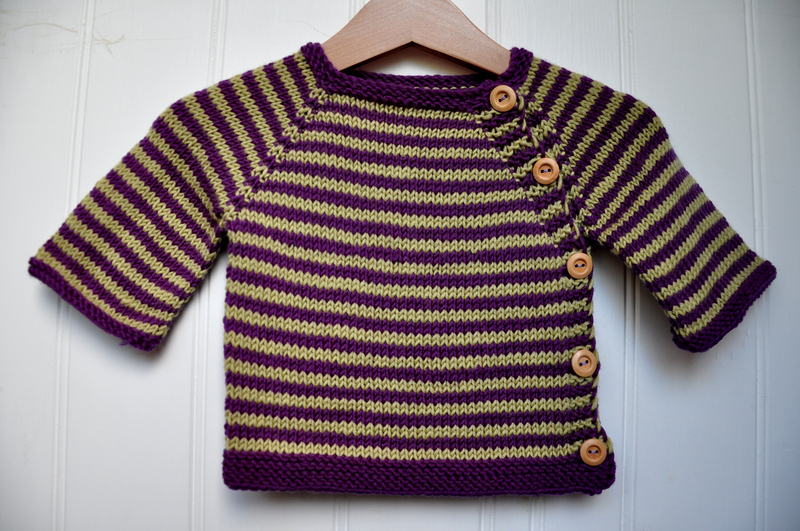 In order to make a smaller size I chose to knit the 6-12 months size using 4ply yarn on 3.5mm needles. This was a really quick knit, despite the small needle size. It took me around 4 days total, with maybe an hour or two knitting on each day. As I really have no concept of what size any babies are I can only hope for the best with this cardigan. I doubt I’ll ever get bored knitting this pattern, but just incase, what’s your favourite baby pattern? Wow, I have really been neglecting my blog recently. I’m putting it down to having started an internship recently (more on that in a later blog post, if I get around to it). It’s also getting more wintery by the day here so trying to get daylight photographs is difficult, even on the weekends, gah. But I’ve been knitting up a storm even if I haven’t been writing about my projects. At some point I’ll have three hats, a pair of mittens, another baby cardigan, a shawl that is destined to be ripped out any day now and some knitted jewellery to share with you. I also need a new notebook, but I want a pretty one so I’m working on an idea for that. 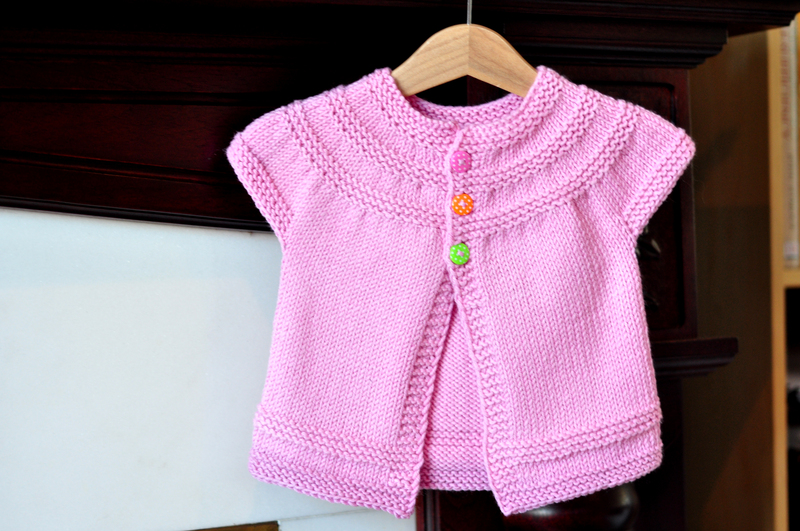 But today I have a baby cardie to share with you. This is the second time I’ve knitted this pattern and I’m still as much in love with it as the first version. There are no sleeves to be knitted, it’s top down and seamless and the button band is knitted as you go so once you’re finished, you’re finished. All I had to do was sew on these cute buttons and it’s ready to send off to the latest member of my extended family. This is now officially my go-to pattern [In Threes by Kelly Herdrich], but I would love to know what baby pattern you find yourself knitting over and over again. Let me know in the comments! 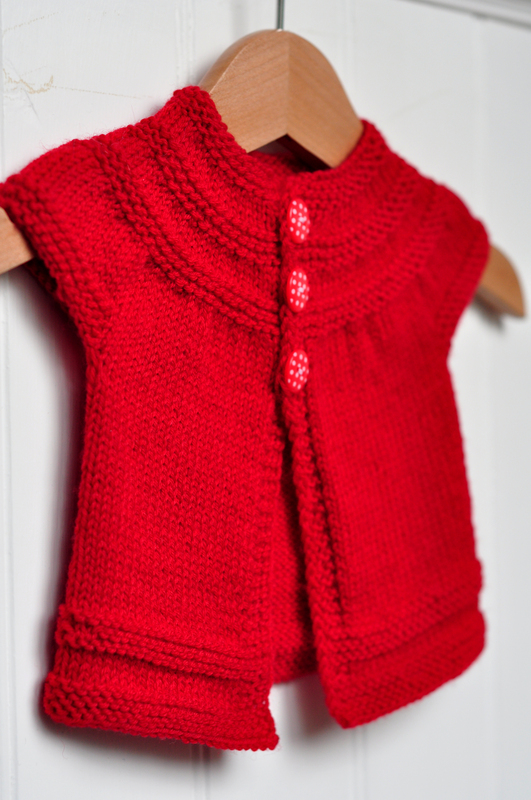 I think this may be my new favourite baby cardigan pattern. It’s supposed to be knit using Aran weight yarn, and I suspect that makes it an incredibly quick knit. I had some lovely yellow DK (machine washable) yarn in my stash, so although I was knitting for a two year old I chose the 3T size. This is the perfect pattern because it’s super cute (!!!!) and it’s knit all in one piece. The cap sleeves mean you don’t need to use DPNs for the sleeves, you simply cast off the stitches and you’re done. 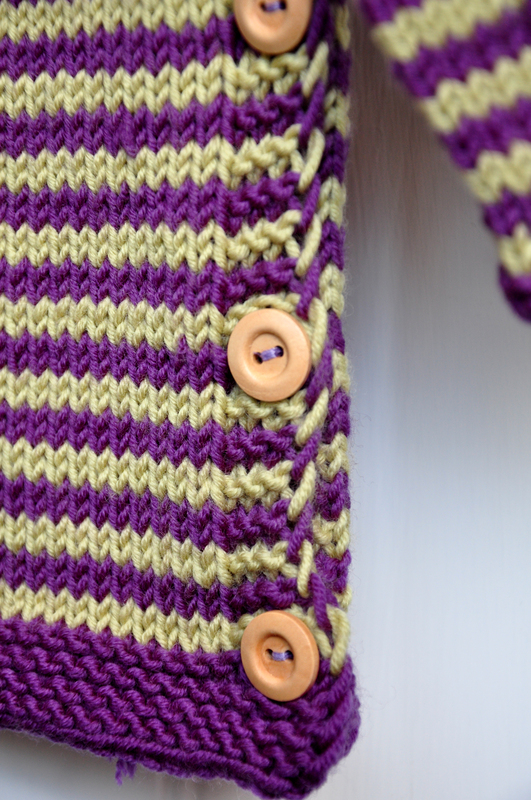 And the button band is also knit as you go along, so there’s no need to pick up any stitches. Plus, did I mention how cute the garter ridges are? Very, very cute. I used a bit over two balls of the Jaeger Baby Merino, so I just have just under two balls left. 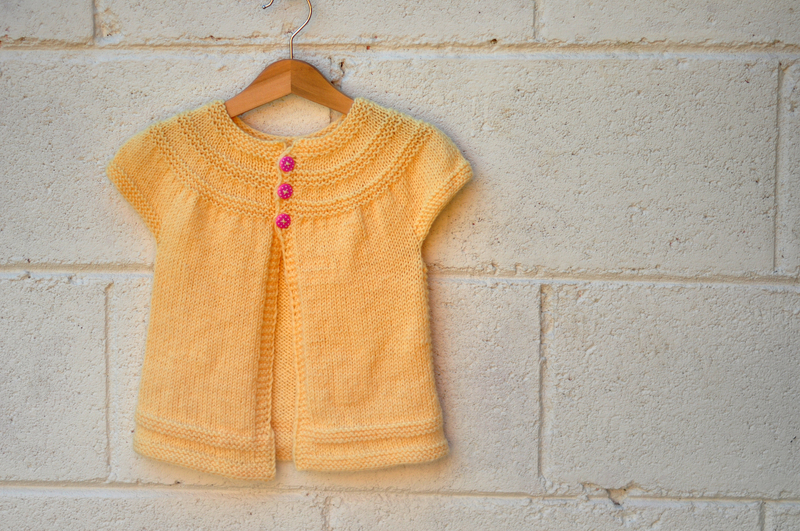 I can definitely see another of these yellow cardigans (in a smaller size) in my future. I’ts a really quick knit and will make another great gift for someone in the future.